The last year and a half or so has been quite a roller coaster ride with worry/anguish/anxiety over our daughter’s health issues. I cannot even put into words what we’ve gone through, so I won’t…. But, things have resolved, and she’s come through surgery and now radiation, with flying colors, so we are all relieved beyond belief. In the midst of dealing with our daughter’s healing process, our daughter in law suffered a miscarriage, which threw us into more grieving. Things were mighty, mighty rough. I felt like I had to keep a very tight lid on the volcano of emotions- the worry, fear, uncertainty, sorrow, anguish, grief- you know – all that stuff that roils up when your beloved children are having a hard time. Plus, we were all working our socks off all summer while dealing with all of this, and it just was so intense that it meant that I simply had to hold a very very tight focus, emotionally. For me, the most healing way of doing that is in making art…. This is the direct result of the beginning of the process of transforming my volcano of emotion into a positive expression of beauty, while using all that energy in a directed way. My husband and I took a break for a weekend at the beginning of September, and went to the west coast to visit sisters. We came home with our suitcases full of driftwood, sea glass and seaweed- some of my most favorite raw materials, ever. Three of the pieces of driftwood in particular called out to me. So did a dried up kelp root, called, a ‘holdfast’, that one of my sisters gave to me- she has treasured it for a long time, and so it’s very precious. The metaphor of ‘holdfast’, of roots holding a great kelp tree anchored in the ocean spoke so deeply to me as a symbol of what I, as the mother of young women and their loved ones in a time of troubles, was called to do in holding the energy for my family. So, the name: Mother Holdfast rings true for me. Here is the holdfast, being held fast in ‘Mother Holdfast’s hands…. which I made from wire. 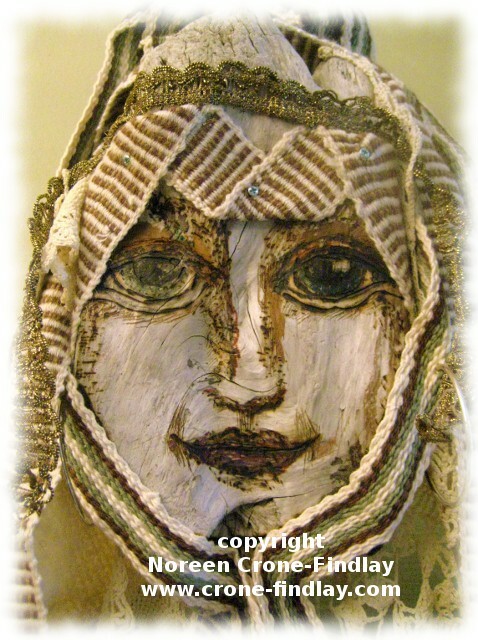 As soon as I drew, then burned the face onto the ‘head’ piece of driftwood, Mother Holdfast let me know exactly what colors and textures she wanted me to weave. 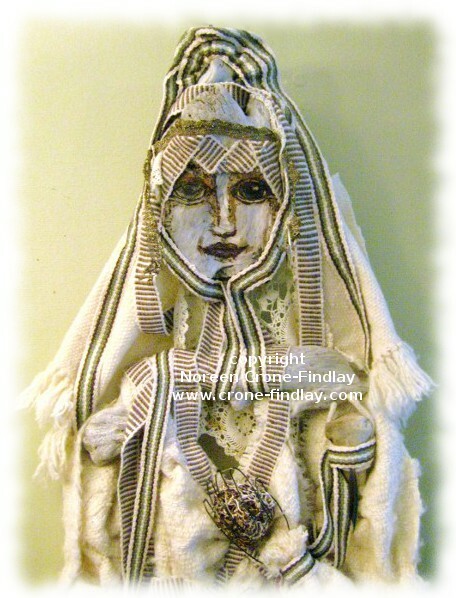 So, I warped up and wove at a feverish, furious pace…..
And, then, I started layering, stitching, layering more, weaving more…. Until Mother Holdfast was complete…. She is TALL! She is almost 6 feet 6 inches tall…. 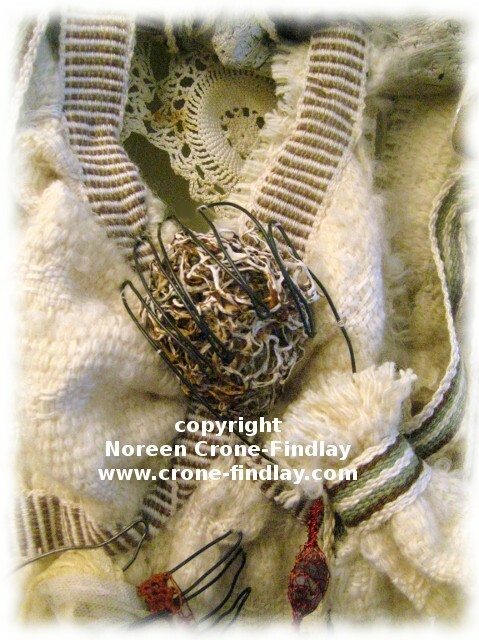 As well as my woven fabrics and inkle bands, I have also stitched and woven in antique and vintage lace fragments, tatting (tatting goes with me everywhere, and keeps me sane when I am having to wait or watch or…), smaller fragments of driftwood and seaweed, and spool knitted wire cords that I filled with sea glass. 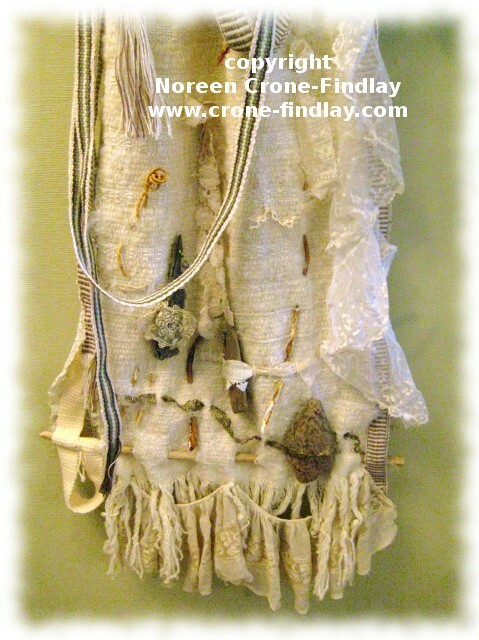 ‘Mother Holdfast’ has been a powerful healing experience for me to create. she is beautiful! kudos to you, and prayers for you and your family…. I do the same thing,with all this pain in my lower back,and legs.Thank God we’re creative,hey? Thank you so much, Susan and yes, being creative is a blessing beyond measure! She is as lovely as the thoughts you put into creating her. Full of strength and beauty – with roots held fast in her hands – grounding and yet she seems to be floating. Such a presence coming from such difficult times! Fabulous Noreen! 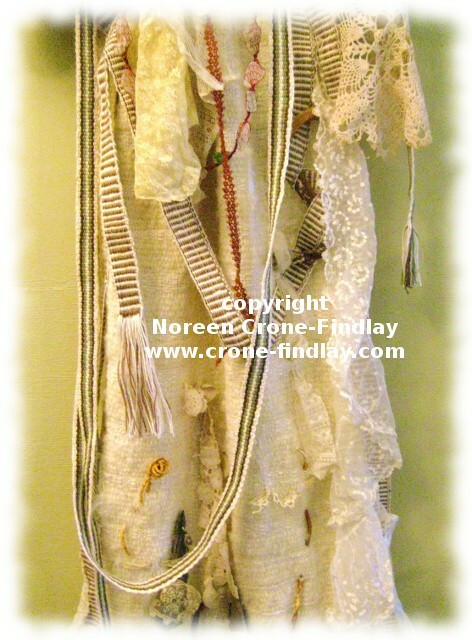 Thank you so much, Terri – she was incredibly healing to weave- VERY Saori! I haven’t yet met you , but your words ring very true with me on the struggles we have with our children and their health. An amazing creation of strength and love. Hope to meet you here one day on the West Coast! Thank you, Lynn- yes… motherhood is eternal! I look forward to meeting you, too! Thank you so much, Sharon, and I am so grateful, too. I feel blessed! Oh, Claire, I am sending waves of compassion! Blessings, blessings and hugs upon your journey! Awwwwwww thank you thank you, Caroline! Absolutely amazing!! I love Mother Holdfast!! !